This visit was organised by Wendy through her daughter Emma Clements. Emma is the Assistant Editor of BBC Radio Devon and also kindly provided the photos for this report. 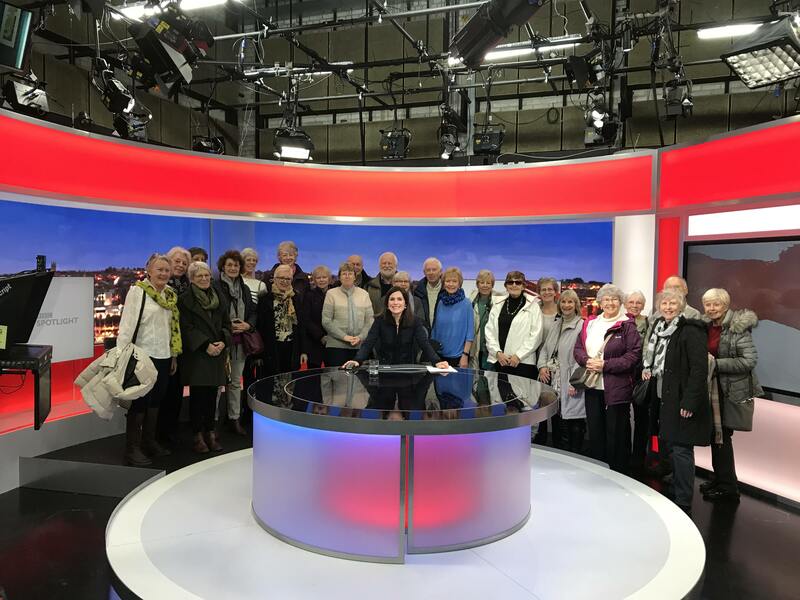 Twenty four members made their way to Plymouth by bus or train, most of us meeting up in Marks and Spencer’s for lunch, before catching another bus to the BBC Southwest Studios in Mannamead. Emma Clements met us and we were taken to the conference room where we learned about the development of the BBC in Plymouth since 1924. Spotlight is the most watched weekday TV programme on any TV channel in the whole of the south west of England with more viewers than Eastenders or Coronation Street. The recent refurbishment cost £15 million, of which £7 million was spent on cutting edge technology. 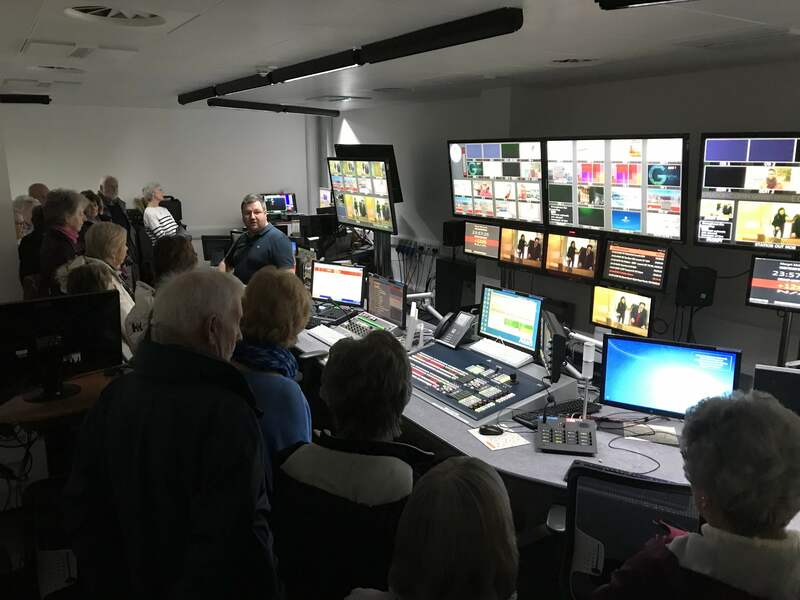 We saw how local news is filtered into the national output with split second timing, watching as the final touches were made to the 1.30 Spotlight news, listening to the director’s instructions and precise timings of the broadcast. After the transmission we were taken into the Spotlight studio where we met Clare Woodling, the news presenter, and the programme director. The studio is the most modern BBC regional studio. Adjoining the studio, the Gallery is the most modern in the English regions with only London and Salford having similar systems. The director is in overall charge, responsible for the look of the programme. Live weather is used to keep the programme on time for the 27 minute slot. Weather presenters are highly skilled to speak to exact times without autocue or script. The group split into two sections for the Radio Devon tour. BBC Radio Devon started broadcasting on the 17th January 1983 from the car park of our former Exeter studios as the main building wasn’t ready in time. It is one of the UK’s most popular radio stations, broadcasting 21 hours a day, with roughly one in four people in the county tuning in each week. Around 35 staff work for Radio Devon plus freelancers. The Hub is the first port of call in the newsroom for any TV material coming into the building. All material is displayed on a screen so the journalists know it is in and ready to process to the various outlets eg editors producers or radio, online journalists. Finally, the group visited a studio where we saw Janet Kipling presenting the lunchtime phone in and met Michael Chequer who was about to prepare his evening programme.